Chloe is about four years old, and is a sweetie! Chloe is a very independent bunny, and would rather be hopping around in the yard than snuggling. I've had her for about a year, and got her from a person looking to downsize on the amount of rabbits they kept for 4H. 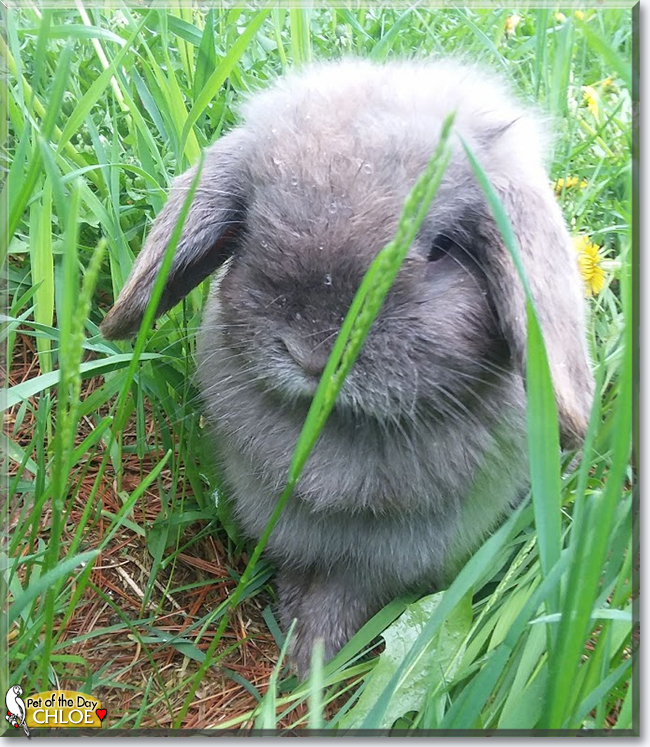 She is a blue tortoiseshell holland lop, and her preferred ear position is one up and one down. She doesn't typically bite, but sometimes does get a little worked up. Chloe s a digger, too! She has a very nice tunnel that has two entrances to get in and out of, and that also helps her stay cool. She is very attached to her companion, Zelda, who is roughly a year older than her. Zelda is blind in one eye, so Chloe always makes sure that they stay close, and that Zelda doesn't get lost. I love her! Talk about Chloe in Pet Talk!